What's happening? Has it turned into Autumn overnight - leaves falling, a drop in temperature and rain'a'plenty? And that's still in August! However, this has given me a great opportunity to test run my 'new' shearling jacket. Mind you, any long-term eagle-eyed reader might spot that the jacket itself is not exactly new. I featured it on my blog last year ('The North Wind Doth Blow') in what was one of my favourite posts to date. The leather jacket came from a charity shop for the grand sum of £1.25 last year. Not only is it Escada, but it has the butteriest leather, vintage style buttons and a blue wool lining. Why the cheap price? 1.) It had a small rip underneath a button, which was easily fixed by re-sewing it down.. 2.) It came from one of my favourite local charity shops, who put out pretty much everything that is donated - be it Primark or Prada. I made sure that the new false collar is only attached to the lining, meaning that it can be removed again if needs be. I'm not often one to follow trends, but the Autumn/ winter collections this year seem like some of the most desirable and wearable I've seen - classic shapes, understated colours and standout works of craftsmanship. From the cult status of Christopher Bailey's designs, to the demi-couture aesthetic of Erdem or the bright ideas of up-and-coming designer Charlotte Taylor, there's more than enough eye-candy/clothes candy to salivate over this season. My mum took these photos in a small gale. The clouds lowered more and more by the minute, with mum saying, "I can't see your face! It's too dark," and me trying to hold back my hair, as it seemed to be determined to make me look like a yeti. However, the wind added a nice touch, and I was definitely feeling 'Autumnal Vibes' in the cold. And I can happily report that the customised jacket performed its job of keeping me warm to perfection. I think it will be getting alot of use as my "photographer jacket" in the next few months. I did another behind-the-camera Autumnal themed shoot today (They're starting to stack up on my computer...) with someone else called Roz! It was quite surreal ringing up to confirm the shoot by saying "Hi it's Roz. Is Roz there?" Autumn is by far my favourite season, and I can't wait for the photography opportunities, design inspiration and wonderful walks it brings. Not that I want to wish away the end of the summer, but it looks like it's been shunted out of place already, and I'm ready to embrace the weather. Though I'm sad about the turning of the seasons, it proved to produce some lovely photos, you look stunning as always, and there's not a yeti in sight. Another brilliant post too. this outfit is brilliant. the shearling lining plus lace make an unexpected pairing that works quite well. Love love love the jacket. I can't believe you made your jacket!! It looks fabulous (just as good as the Burberry ones). I love and follow your blog. Come stop by mine! you have reallly neat and stunning fashion! I love it!! Gorgeous outfit, i especially love the boots!!! I absolutely adore the fact that you repurposed this into a shearling jacket. I'm a former, well...almost pilot. (I went through flight school through an Air Force auxiliary, but didn't end up getting my license) But I have a love of all things aviation, so this fall/winter season is right up that alley. I love both the fact that you put together a smashing outfit, but also that you make the jacket into a shearling style yourself. I envy the DIY a bit as I can't sew to save my life. So keep it coming! I'm brimming with excitement to see what you come up with next! YOU LOOK FANTASTIC. perfect autumnal ensemble, and I love how crafty you get, keep on trend without being trendy or a spendthrift. AND these are the best mom-pics to date. Your mum is stepping up her game and making some good fashion compositions that are nearly rivaling...your dad. Tell her I said so! Wow, you were so lucky to find that jacket last yer - before the 'trend' now I am sure someone would have snapped it up and tried to get hundreds on ebay! You, look so wonderful and full of life. I love wind pictures. I love jacket. That is a beautiful jacket...very unique! Love the sheerling jacket! I'm searching for one too. so gorgeous! love the dress! I love how you put it together! ah shearling! the essence of a/w. Christopher Bailey would be proud! It really has become Autumn overnight! I'm actually quite excited - Autumn outfits (like yours!!) are always so much more inspiring. Your jacket is one of the most elegant variations on the pilot jacket I have ever seen. I wish I could sew like that. oh i do enjoy your blog :) ahead-of-the-trend high five! Very impressive customisation if i may say :). I wish i was more inventive with altering clothes, i'm afraid my own sewing skills only extend to the simple hemming/taking up of old clothes. 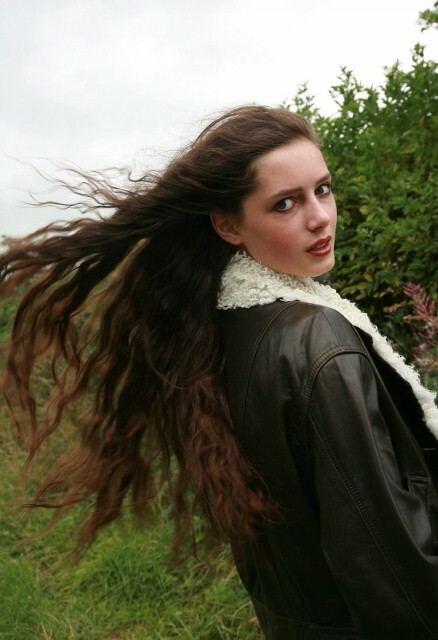 Your hair looks gorgeous windswept, the weather certainly looks autumnal here! I like all the different textures: shearling, lace and suede also the pop of colour from the ring. perfect and not too trendy. happy to have found you again. Come visit us soon. WOW!! Seriously, we are speechless! This jacket is amazing! Never ever would have guessed it to be a diy job. I think it looks even more great because the jacket was of high quality in the first place, being an Escada. (what a bargain!) This post is so inspirational - thank you! http://www.thewardrobewars.blogspot.com - take a look if you get a chance, we'd really love your feedback - follow if you like what you see. Beautiful photos and outfit! I'm surprised L'Oreal haven't offered you an advertising deal for the second one! I really admire how you don't fork out ridiculous prices for your clothes and thrift them - either charity shop buying and/or customizing. Your outfit is bang on trend, individual and practical at the same time. It looks amazing too! From following your blog I can see that your clothes are rarely high street bought and I think it is a great trait to have! Keep up the good work Roz, you're an inspiration to us all! great outfit! :) love the jacket. i like your blog. hope you will become a follower of my blog too? oh, oh, love love love! This is great! I love it!